Your challenge is our challenge! Whether it’s providing safe access to your home or your business, in order to better serve those with limited mobility or to move product safely and easily, we always are searching for new products to accommodate your needs. We will help you achieve your goal by offering a safe and durable access solution for your home or any other building..
Eureka Solutions offers a wide variety of portable ramps and threshold for easy access to your home or your vehicle. The length of the portable ramp is important depending on the height to be traveled to ensure that the angle of inclination will not be too steep and will not present a danger of tipping for the person in a wheelchair. Several lengths are available, the ramps have a capacity of 600lb and have been awarded Underwriters Laboratories Certification; therefore, subjected to tests with 3 times the above-mentioned capacity. Made from Aluminum, with non-slip surface, you can carry them like a suitcase since they are foldable in 2 or 4 sections. Our product line also includes a modular ramp system for private or commercial use that allows you to access a height that is not accessible with a portable ramp. 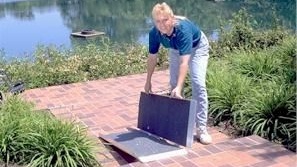 Eureka Solutions has a wheelchair ramp to fit your needs. The ARMADA SYSTEM is a residential modular ramp, while the A*COM System is a commercial modular ramp, both can easily be moved or reconfigured if you have to relocate. Made of anodized aluminum, it will remain good looking through years of use. Nothing is forgotten for our clientele, they can avoid the hot summer days by taking advantage of their swimming pool, above or in ground, or even their whirlpool bath. What a pleasure to consider! Different models are offered according to the customer’s need. All the Aquatic Seats we sell are Water powered only, no battery to replace and mostly, no electricity needed. Simply plugged into your garden hose, with a simple turning knob, the seat will lift and bring you into your pool. Some models will rotate 180 degrees, other will require manual rotation. Depending on the water pressure you have at home, the seat can lift a person up to 400lb. In the fall, you remove your equipment, store it for the winter season and when spring comes again, reinstall it while waiting for the appropriate temperature. We develop customized solutions for your needs.